Global weather disturbances like global warming are proof that weather and climate are not impervious to human intervention. If we can alter the weather inadvertently – throught technological recklessness – we can also alter it willfully. 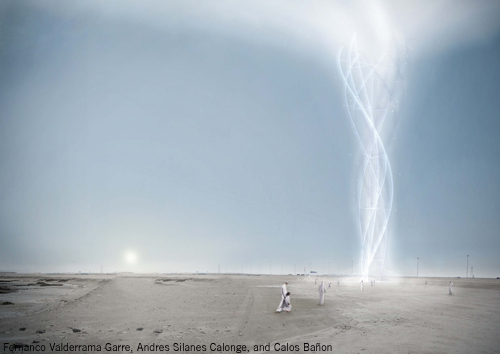 Climate Art Generator is what is trying to avoid, a human-induced climate change. It is contradictory, seemingly. 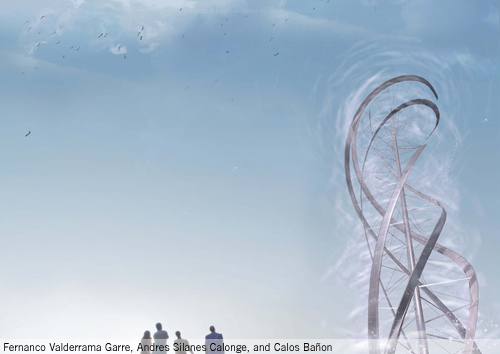 Is a device that produces clean energy and generates a local climate change as an artistic experience. It is not produced by humans, just induced. A great opportunity for us to rethink about the modern age culture of controlling everything. Weather is the center of a technological debate. Our cultural anxiety about the weather can be attributed to its unpredictability. As an expression of nature, the unpredictability of weather points out the limitations of technological culture. While advanced methods of detection and tracking help to warn and thus protect us from the ravages of nature, the weather is unstoppable. It’s beyond our control. Climate Art Generator is not inspired by nature, is activated by nature. As a secondary expression of nature, hasn’t a constant shape. Is recursive, created by the weather and weather modifier. An alteration that unleashes a reaction. It is the inflection point in a field of vectors. Form follows equation. It is mathematical. It has a maximum and a minimum. If stops, nothing happens. If nothing happens, stops. Can’t control it, just enjoy! It´s predictable as weather. It´s unpredictable as weather. Activates human attraction to natural phenomena. Being local, concentrated, becomes tangible and therefore emotional. While changes in time, allows us to relate inputs and learn, an educational experience. By avoiding CO2 emissions and cancelling their effects, is both preventive and active. Has a double positive impact. We use a hybrid strategy that combines global long term and a local short time consequences. 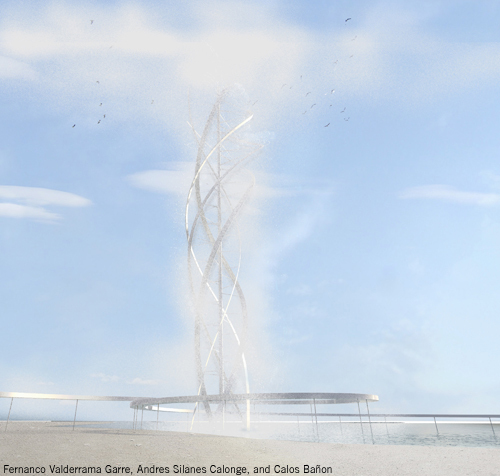 As a vertical windmill, it harnesses the kinetic energy of the wind to generate 1500kW of clean electricity. Doesn´t need to face into the prevailing winds, eliminating the need for a yaw mechanism. It works, but converting wind into electricity and transporting it means that a lot of energy is lost. In a more direct way, part of the energy generated is dedicated to pump sea water to the top, accumulating potential energy. There is no water accumulation. In a continuous process, water falls inside the blades accelerated by the force of gravity. Clouds are a key component of the Earth’s climate system. They can both heat the planet by trapping the longer-wavelength radiation given off from the Earth’s surface and cool it by reflecting incoming shorter wavelength radiation back into space. The greater weight of the second mechanism means that, on balance, clouds have a cooling effect.